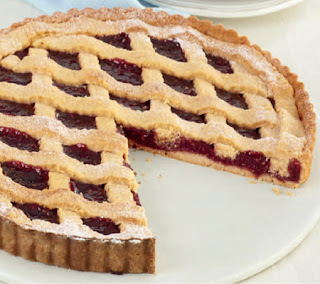 The Almond and Raspberry Lattice Tart Recipe This is the Viennese specialty “Linzertorte” made with almond lattice pastry. 1 Sift the flour into a bowl. Mix in the cloves, cinnamon, and almonds, and make a well. 2 Using your fingers, mix the butter, yolk, sugar, salt, juice, and zest. Place in the well. 3 Draw in the flour and work it until coarse crumbs form. Mix the dough into a ball. 4 Knead dough for 1–2 minutes until smooth. Wrap in plastic wrap. Chill for 1–2 hours. 5 Cook the sugar and raspberries in a saucepan for 10–12 minutes, until thick. Cool. 6 With the back of a wooden spoon, press half of the fruit pulp through a sieve. 7 Stir in the remaining pulp. Grease the pan and preheat the oven to 375°F (190°C). 8 Flour the work surface. Roll out two-thirds of the dough into an 11in (28cm) round. 9 Use the dough to line the pan and cut off any excess overhanging the sides. 10 Spread the filling in the shell. Roll the rest of the dough to a 6 x 12in (15 x 30cm) rectangle. 11 Using a fluted wheel for a decorative edge, cut the dough into 12 x 1⁄2in- (1cm) strips. 12 Arrange half the strips from left to right over the tart, 1⁄4in (2cm) apart. Turn the tart 45°. 13 Place the other strips diagonally. Trim, roll out the trimmings, and cut 4 strips. 14 Brush the edge with water and fix the edge strips. Chill for 15 minutes. 15 Bake for 15 minutes. Reduce to 350°F (180°C) and bake for 25–30 minutes more. 16 Leave to cool then remove from the pan and, about 30 minutes before serving, lightly dust with confectioner’s sugar. STORE The tart can be stored in an airtight container for up to 2 days; the flavor will mellow.